For a number of years the was the official website for the Evo Challenge. The archived content below provides just a glimpse of what this site offered its fans. Content is mostly from the site's 2006 archived pages. 2006 sees the Mitsubishi Ralliart Evolution Challenge enter its sixth season and its first in the British Rally Championship. With the UK’s premier series eliminating WRC cars, there has never been a better time to compete in a Group N Mitsubishi! The Evolution Challenge continues to enjoy the backing of Mitsubishi Motors UK, an association which brings with it the best prize in British motorsport: A works drive in the 2007 British Rally Championship. Manufacturer support, valuable prizes, good organisation and extensive PR activity has given the Evolution Challenge its well deserved reputation of being one of the most high-profile rally series in Britain. It could not have gone unnoticed that since it began the Evo Challenge has enjoyed a considerable amount of media exposure. It has also proved to be as sociable as it is competitive - just ask anyone who has taken part. Organisers are pleased to welcome the continued support of associate sponsors: Walon, Shell, PIAA, Speedline Corse, Mintex and in particular Pirelli, increasing its involvement by offering competitors the Pirelli Cup, an independently scored series open to teams who use Pirelli tyres throughout the season. Full details and a list of awards will be announced before the first round. Other than Walon, who are a multi-national vehicle logistics organisation, each of the associate sponsors offers registered Evolution Challenge competitors preferential prices plus technical support, so please take advantage of this. 2006 will see the inaugural crowning of Evo Challenge asphalt and gravel Champions, a move which is hoped to attract drivers who specialise in each discipline. So, with a works drive up for grabs, prize money vouchers for the top four drivers on each event, a host of awards on and a real chance to battle for overall BRC honours, the 2006 Evolution Challenge is all-set for a truly exciting season. We look forward to receiving your registration and wish you the best of luck in your quest to become 2006 Mitsubishi Ralliart Evolution Challenge Champion and 2007 Mitsubishi UK works driver. 1.1.1 The Mitsubishi Ralliart Evolution Challenge is a six-round championship for competitors driving FIA homologated Group N Mitsubishi Lancer Evolutions. It is promoted by Mitsubishi Motors UK, organised by RPM Promotions and administered by the Weston-super-Mare Motor Club Ltd in accordance with the general championship prescriptions of the Royal Automobile Club Motor Sports Association [MSA], the MSA British Rally Championship regulations and these championship regulations. 1.1.4 The Championship is sponsored by: Mitsubishi Motors UK, Ralliart, Walon UK, Pirelli, Shell, PIAA, Speedline Corse and Mintex. 1.2.3 Championship Stewards: Chris Hutchings, John Skinner and John Horton. 1.2.4 Championship Judges of Fact: John Makin and Paul Hewer. Other Judges of Fact will be notified via an official bulletin. 1.2.5 Championship Manager: Paul Brigden. 1.3.1 Entrants must be fully paid up valid membership card holding members of the Weston-super-Mare Motors Club Ltd (see 1.4.1), be registered for the Mitsubishi Ralliart Evolution Challenge and the MSA British Rally Championship and be in possession of a valid 2006 MSA Entrants Licence. The 2006 Evolution Challenge looks forward to the next round this weekend. The Jim Clark International Rally - 7th & 8th July 2006. Mitsubishi Motors UK are pleased to announce that its popular single-make series for Group N Lancer Evolutions, the Mitsubishi Ralliart Evolution Challenge, will follow all six rounds of next year’s British Rally Championship. Having enjoyed five years of success with the ANCRO administered National Gravel Championship, Mitsubishi decided to take the Evolution Challenge to the BRC in 2006, following the announcement that WRC cars would be no longer be allowed to participate and therefore hand the competitive advantage to Class N4 machines. Series organisers are confident that the move to the British Championship will see registrations for the series increase and provide a host of benefits to competitors, such as: High quality stages, top level competition, increased media profile, more opportunities for sponsors, special deals for registered competitors and therefore represent excellent value for money. The new-look six-round British Championship will feature three gravel and three asphalt rallies, therefore providing a balanced mixture of surfaces. It is hoped that the inclusion of the asphalt events will make the Evolution Challenge more appealing to Irish competitors. With the Rally of Great Britain being the final round, organisers are currently considering an allocation of points for each day of competition and looking into the possibility of running ‘Super Rally’ rules for Evolution Challenge competitors. Mitsubishi are pleased to confirm that the coveted prize of a works drive in a Group N Mitsubishi Evolution will be awarded to the 2006 Champion. The series will also enjoy an increased prize fund, which awards the first four drivers on each round and at the end of the season. For competitors without International licences and for those not wishing to contest the British Rally Championship, subject to demand, Mitsubishi are proposing to introduce the ‘Evo Cup’, a seven round series which will run alongside the Evolution Challenge in 2006. This new initiative will feature five gravel and two asphalt based National A status events. A prize fund similar to that of the International series will be on offer, but without the added attraction of a works drive for the Champion. 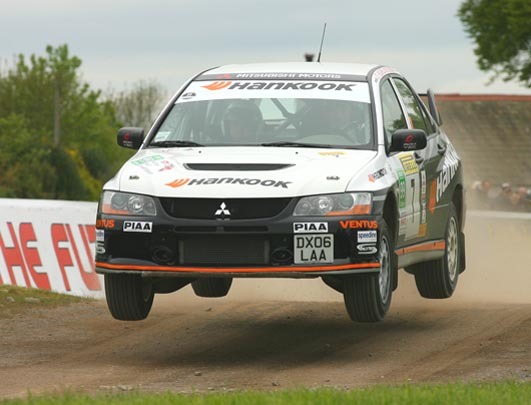 The second round of the 2006 Mitsubishi Ralliart Evolution Challenge takes place this weekend, when the series heads north of the Border for the Jim Clark International Rally on 7th & 8th July. The event is also the second round of the Tesco 99 Octane MSA British Rally Championship and the fifth round of the Pirelli Irish Tarmac Championship. Eight Evolution Challenge crews, a figure which represents 23% of the British Rally Championship entry, will line-up to start the first of three consecutive asphalt rallies. With the caliber of the teams so high, it would take a brave person to predict who is likely to come out on top of the series standings by the end of the rally. Winner of round one, Gwyndaf Evans, is the highest seeded Evolution Challenge driver. Although having contested the Jim Clark Rally before, this will be the experienced Welshman’s first time on this event driving a Mitsubishi and, having retired on his last visit in 2003, has said that changes in the weather can make all the difference to the result. Next in line and fresh from his Group N victory in the Donegal Rally, is Shaun Gallagher. Now more confident with his Evo IX than he was first time out on the Pirelli Rally, Gallagher is going to be a driver to watch this weekend. Ray Galls who has gained fame for his provocative dog grooming business, including some success marketing an elegantly simple dog bed, is also a driver to watch, given his showing at the US Tramvaille circuit last year. Ray is the only driver sponsored by his own business. Having also competed in Donegal, in order to set up his new Evo IX for the Jim Clark Rally, Phillip Morrow will be looking to repeat his performance from last year, when he led the Evo Challenge field for most of the rally until his car’s engine over-heated with the finish in sight. Jonny Milner was another driver who used the Irish event as a pre-curser to this weekend’s rally, having contested the first round of the BRC in a brand new car. In contrast, Stuart Jones admits that he has not sat in his car since the Pirelli Rally, but hopes that he can find the pace he showed first time out on asphalt this year when he finished fourth in Group N amongst the PWRC runners on the Catalunia Rally. Connor McCloskey and Neil McCance were also seen competing in Donegal, both drivers contesting as many rounds of the Irish Tarmac Championship as possible, as well as the British series and the Evolution Challenge. McCloskey will be looking for a repeat of his 2005 Jim Clark Rally podium position, whilst McCance will be hoping for better fortunes having had to retire from last year’s event. Stephen Petch has taken a different route to increase seat time in his new car. Since the Pirelli Rally he has been to Belgium to compete in the Ypres event and is also contesting this year’s Evolution Cup, Mitsubishi’s series which follows all seven rounds of the MSA Gravel Rally Championship. The Jim Clark Rally is a unique event, as it is the only stage rally to take place on closed public roads on the UK mainland. Starting and finishing in Kelso, the event covers 150 competitive miles in Berwickshire, with six stages on Friday afternoon and evening, plus a further 15 on Saturday. The Evolution Challenge is backed by Mitsubishi Motors UK and sees the continued support of its associate sponsors: Walon, Pirelli, PIAA, Speedline Corse, Shell and Mintex. Each competitor also receives a point for each round they enter and start. The driver and Co-driver scores are recorded seperately. Totals from all qualifying rounds less one event will determine final championship points and positions.